Going on an adventure is generally a good thing. 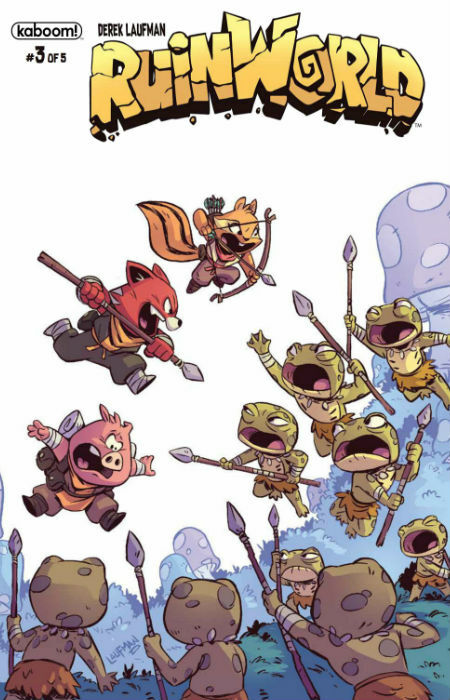 But not it appears in RuinWorld by Derek Laufman, where cities are few and declining, brigands abound, artifacts are scarce and worth their magical weight in gold, and not if you’re Rex, a half cat/half fox Ruin Hunter who is saddled with the lovably incompetent Pogo, a pig who dreams of glory but falls manifestly short pretty much every time. Oh, and throw in monster spiders, giant slugs – pro tip: “If they get ahold of you just let them eat you; the alternative is worse.” – and tenacious squid demons summoned by a spell from a mage’s book that is clearly in the wrong hands (yes, that would be Pogo – how’d you guess?) who are determined to drag you … well, best not to think about that, just kill them. Which Rex does, and while he threatens to kill Pogo, to whom he owes a debt after the enthusiastically inept pig’s mum sheltered him on her farm after he fell out of favour with the powers that be, for unleashing the beast, he never actually follows through. Besides, all that squid demon-unleashing and ruined keep-investigating has a rich payoff – a treasure map that leads the way to – GASP! – the fabled treasure trove of Rygone the Dark Pirate, full to the brim with 100 years of plunder from temples aplenty. All they have to do is find the Temple of Kuloo and it’s theirs. 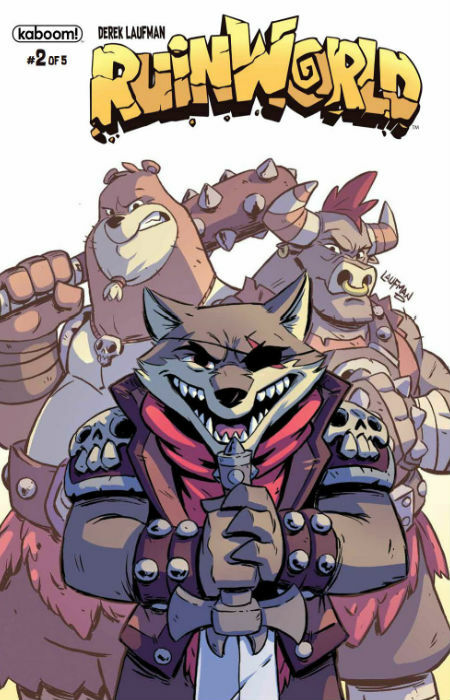 The problem is they keep losing the map – first to an opportunistic scavenger called Barri, an insect who is given a surprisingly affecting backstory – one of the standouts of this epically fun series is Laufman’s attention to character detail which pays off with way more emotional resonance that you might expect from a cute, five-part fantasy adventure comic – and then to Fargus the wolf and his criminal gang who see a highly-promising chance for one last big score. Adding to the difficulty is the fact that GPS has yet to be invented in this medieval world, which has definitely seen far better days, and you have one of those adventures that you’d be far better not actually going on at all. KALE: “Cut the bull dung, Rex. You two are oozing desperation! Just look at ya. Those rags you call clothes tells me you have NO money. That tree branch and twig you two are sporting shows me a desperate need for weapons … and by the looks of your robust companion, it’s very clear to me, Rex, that you have hit rock bottom in your ruin hunting career and you’re badly in need of an experienced partner. Does that sound about right? Desperate they may be, and taken captive, well Pogo anyway, by the frog king of the Dengus Isles, but boy they sure how to make a sucky adventure work. Or worse; honestly it’s hard to say. What can be said with complete certainty is the Laufman has gifted us with characters so delightfully flawed – there’s no real hero here; just a bunch of struggling animals trying to catch a break in a land perilously short of them – that you want to spend as much as possible with them. The banter between Rex and Pogo, in fact between all the characters is a pleasure to read, witty, fun and flowing with barely an awkward moment; every exchange crackles with the comedic vivacity of a finely-honed sitcom, with every character possessed of razor-sharp, side-splittingly funny comic timing. In many ways it reminds me of the warmth and silly fun of Asterix, the famously clever French comic which snaps, crackles and pop with the same amazing energy, the same richly-wrought characters and formidably good world-building. 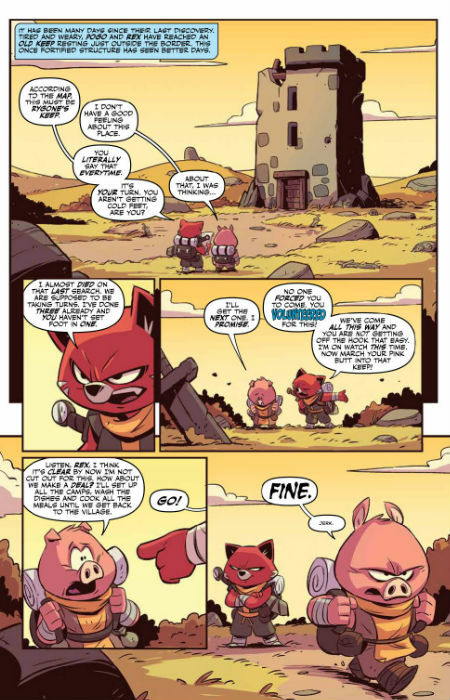 RuinWorld is, of course, its own marvellously immersive creation, benefiting from Laufman’s masterful world-building which springs to life, as if fully-formed, from the word go. With no preamble, we’re plunged straight into the action, unencumbered by laboriously-delivered exposition or hamfisted set-ups, Rex and Pogo bantering from the word go, the land around them a living, breathing decrepit entity that has its own flavour, personality and sense of self and is a joy to inhabit. 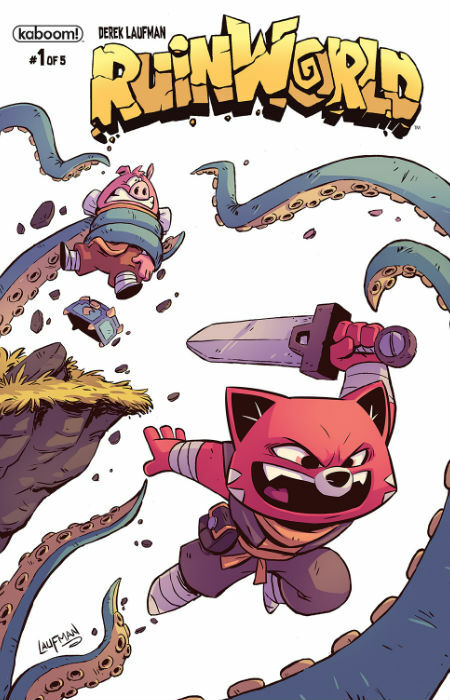 With only five issues in the series, the time we’ll have with RuinWorld, at least in its Kaboom! incarnation is likely to be all-too-brief; thankfully you can catch all the RuinWorld action at Tumblr, where the writer & artist talks about his creation’s humble social media-driven beginnings, and Derek Laufman’s own site. What we do have in the three issues available to date is a gorgeously original comic series, that recalls some famous comic antecedents but is very much its own pleasurable piece of witty, clever fun that proves beyond a doubt that adventures are really only good, treasure maps in your possession notwithstanding, if you have good friends at your side, and an amazingly captivating world in which they can happen.